A Guide to the Cantos of Ezra Pound. New York: Persea Books, 1985. First Edition, First Printing Paperback Near Fine in Wraps 8vo (5-1/2 x 8-1/2), 177 pp including Chronology and selected bibliography. Paperbound book is NEAR FINE -- all pages clean and tight, may be unread as there is no crease on spine, in NEAR FINE glossy pictorial wraps. Only flaws are soft diagonal crease bottom of front cover, and a 2" wide soft blue color covering bottom block of pages. (h) Cookson was editor of Pound's "Selected Prose." He provides brief overview of each canto and an explanation / glossary of terms, names, and quotes from Greek or Chinese, on each canto. Invaluable for anyone wanting to be able to fully enjoy this monumental work. 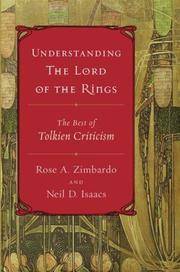 Understanding The Lord of the Rings: The Best of Tolkien Criticism. By Zimbardo, Rose A.; Isaacs, Neil D.
Keepers of the Flame: Literary Estates and the Rise of Biography. London: Hutchinson , 1992. True First Edition -- UK Cloth AS NEW in AS NEW DJ 8vo (6-1/4 x 9-1/2), 344 pp including Notes and Index. Book is AS NEW in AS NEW glossy pictorial DJ. Mr. Hamilton describes the emergence of literary biographies through the medium of literary estate management and mismanagement. The effect estate management and copyright law have had on the relative truths and untruths of biographies. Mr Hamilton gives the great historical biographies and biographers no more respect than they are due -- often none at all, always with wit and insight. TWO VOICES: Crime Writers in Conversation with their Characters. New York: Ballantine Books , N.A.. First Edition Glossy Pictorial Wraps As New in Wraps 8vo (5-1/4 x 8), 102 pp. Paperbound book in glossy pictorial wraps. NEW, AS NEW. Obviously intended as a promotional item, still a fascinating insight into the writer's involvement with the character he or she created, and how that character may have taken on a life of its own.